SpringHill Suites Tempe Arizona Mills Mall hotel is the perfect place for weddings, meetings and any other special event. 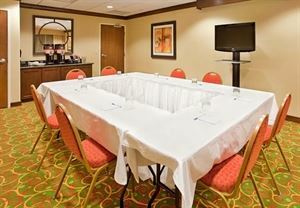 Our Tempe meeting room at the hotel can host up to 25 guests. Make any event a success with free internet access, AV equipment and access to our business center. Overnight guests will enjoy the spacious suites and complimentary hot breakfast buffet. Professional dedicated staff to ensure your business meeting is productive and hassle free. Our medium-sized, 365 square-foot space is perfect for smaller, more intimate events.